If you're looking for a relaxing get-away-from-it-all weekend, the area centered on Mount Lassen is lightly visited, making it an excellent place for an escape. Lassen is popular with nature lovers, hikers, fishermen and the scientifically curious. If you're looking for fine dining, nightlife, and shopping, this is not the place for you. While you're there, you can check out an active volcano that last erupted in 1917, visit gorgeous Mount Shasta and nearby Shasta Lake, or go to a little-known radio telescope site. You'll be anxious to get started planning after you take a look at these Lassen area pictures. You can plan your Lassen trip using the resources below. Lassen weather is best in summer, a short season that may not begin until well into June. Winter brings snow. If you go off-season and midweek, you'll find many places closed. If you've only got a day, take a trip through Lassen National Volcanic Park to see what the landscape looks like almost 100 years after the last volcanic eruption. 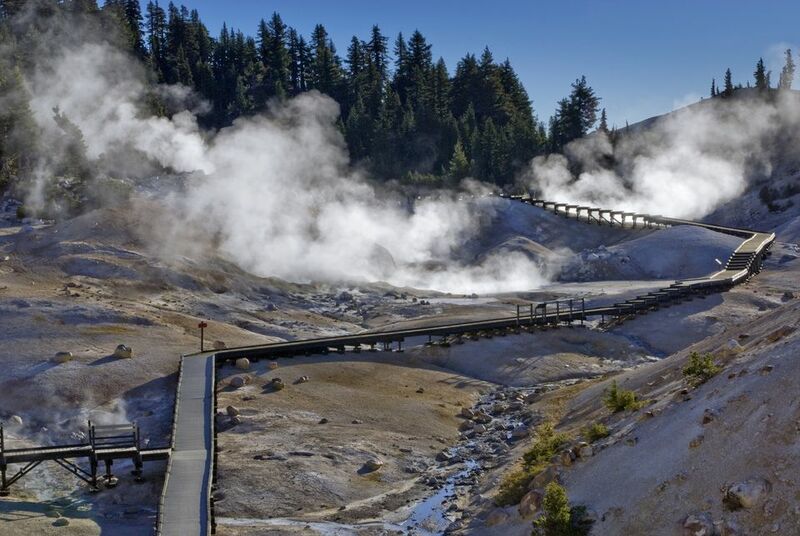 While you're there, explore the area's volcanic and geothermal features. Shasta Country: Drive north on U.S. Highway 89 to Mount Shasta, then turn back south toward where you started. Burney Falls south of McCloud is one of the most popular stops along the route. To find out more about MacArthur Burney Falls State Park read this guide. Wine Tasting: A few fledgling wineries cluster around Manton. Most have no tasting rooms, but that doesn't mean you can't sample their products. Drop in at the Manton Corners bar at 31280 Manton Rd and join the local characters on the porch. They serve wines from several nearby wineries, and if you like something, the adjacent general store sells it by the bottle. Anselmo Vineyards was the first full-featured wine tasting room in the region. Coleman National Fish Hatchery: The largest Chinook salmon and Steelhead hatchery in the contiguous U.S. is open for self-guided tours daily. It's south of Lassen and a few miles east of Interstate Highway 5, a good stop on the way home if you're headed south. Hat Creek Radio Observatory: The Hat Creek Radio Observatory is also called the Allen Telescope Array. The observatory has been in this location for over 50 years, run by the UC Berkeley Radio Astronomy Lab and SETI Institute (Search for Extraterrestrial Intelligence). When completed, the array will have 350 individual units. It's a working facility that offers a self-guided tour off-season and guided tours during busy times but is only open weekdays. Castle Crags State Park: Good hiking and camping beneath jagged granite peaks. And those craggy rocks really do look a little bit like a castle. Be prepared for snow anytime between October and June. During that time, you may need to take snow chains with you even if it isn't snowing when you start your trip. Find out what the rules are. This area seldom gets overcrowded, and the National Park Service says they almost always have camping spaces available. Even if you plan to do only a bit of light hiking, bring your walking poles if you have them. The rocky, volcanic terrain can be hard to navigate in many places. Bring bright flashlights if you want to tour Subway Cave. Unless you cook it yourself, you're not likely to find haute cuisine on your plate in this area. Redline Grill at 31235 Manton Rd is a local favorite, serving up fresh burgers and sandwiches. You can stay at Manzanita Cabins or Drakesbad Guest Ranch in Lassen National Park, but their season is limited, and they fill up fast. If you want to stay outside the national park, your first decision should be whether to go south of Mt. Lassen or north of it, then pick a town or two. Redding is the closest place to stay that has a variety of hotels. You can compare prices and read guest reviews of Redding Hotels at Tripadvisor. If you're traveling in an RV or camper - or even a tent - check these Shasta area campgrounds. The distance to Lassen depends on which side of the park you stay on. From Redding, which is about 50 miles west of the park, it's 215 miles to San Francisco, 160 miles to Sacramento and about 200 miles to Reno.